She's exempt. She's exempt, and utterly dumbfounded on how he missed all the subtext. Also, Tobi's going to clear all the challenges in no time, maybe with a little physical help. I think we can all admit that Tobi found the worst thing of the three. Yet another dungeon to solo Tobi! I like this challenge. At the end either they win and it's sweet, or we get to see some chunky-salsa burning meat sprays as their bones and flesh get separated. What's not to like? Tobi & Speed: I also think Tobi is going to solo (or nearly) this section. If she does, we she might be the greater treasure in the dungeon, safety. Gilda/Bob/Fox: Probably the one exempt, but I agree with Storm that she may be exempt because of the beastman thing and because she might be "White", the weakest of the cleaners, so it is the hardest choice for her yet she is the one who has it. She's got a talent for always finding the worst. Looks like they're having a blast. 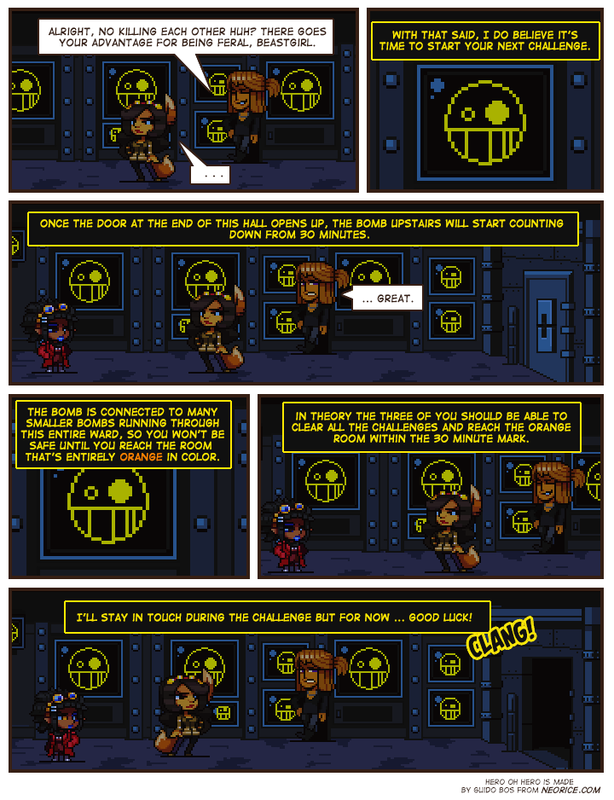 I feel like Tobi should just go back to the bomb room to disable the bomb before leisurely working through the rest of the puzzles.